Your media collection on your mobile device – easy! My hard disk is out of space! We know your time is valuable, so we take care of your video quality. That’s why, in Movavi Video Converter for Mac, we’ve added the ability to convert video files without re-encoding and losing quality with the SuperSpeed mode. This type of video processing is often called remultiplexing or remuxing, and implies that you simply move the video stream from one container (format) to another without re-compressing it. The process is almost instantaneous and doesn’t affect the video quality, since it changes only the format of a file, not its content. 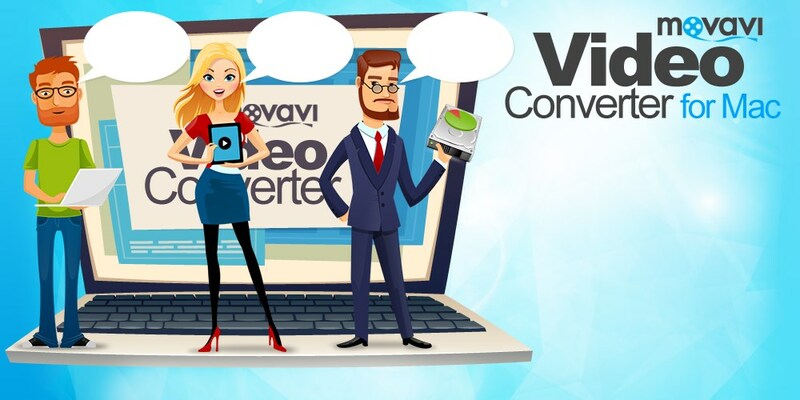 SuperSpeed conversion can be applied to both video streams and audio streams of video files. You can preserve the quality of the original video and get output files of the highest possible quality. Very high processing speed: SuperSpeed conversion is as fast as copying files from one folder to another – up to 81x faster than normal conversions (see the diagram). Converting M2TS (H.264) video (1 min 24 sec, 155 MB, 1920x1080) to MKV, MP4, and MOV formats (top-down). 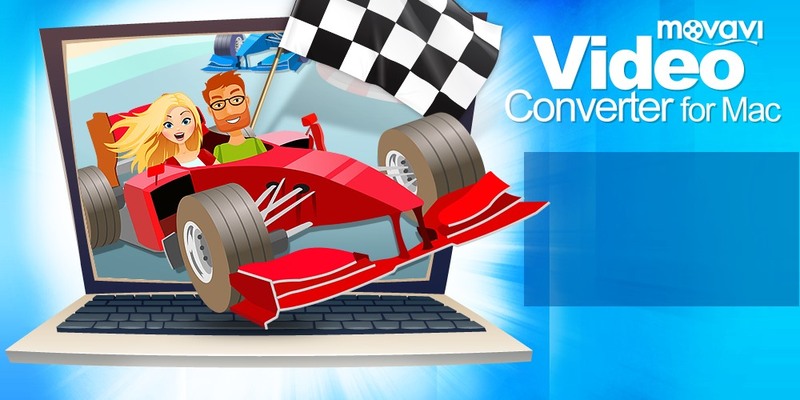 Because SuperSpeed conversion delivers such an unprecedented speed gain – up to 81 times faster than normal – Movavi Video Converter for Mac leaves the competitors in the dust (check the test results below). ** SuperSpeed conversion to a device preset is available if the input file resolution is no higher than the device resolution: 1920×1080 for iPhone 7 Plus, 7, 6s Plus, 6s, 6 Plus and TVs, 1280×720 for iPads, iPhone 6 and SE, Samsung Galaxy Note 3/4/5/Edge, Amazon Kindle, and Google Nexus, 1136×640 for iPhone 5/5c/5s, and 960×640 for iPhone 4/4s. If you want to simply trim your video or audio file from the beginning or the end without wasting time and losing quality, SuperSpeed conversion does the job perfectly: you get trimmed files and the original quality in just a few seconds. You cannot change codecs, resolution, bitrate, or other video parameters. You cannot apply effects to the video, e.g. rotate it, or compress files. 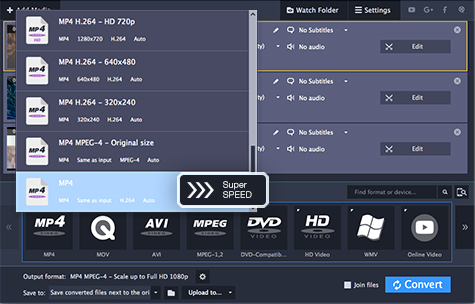 After you’ve added files to Movavi Video Converter, all presets on the Video and Devices tabs that support SuperSpeed conversion for at least one of the added files will be marked with the SuperSpeed tag. After you choose one of these presets, all the files that will be converted without re-compression are labelled with the text Original quality next to the estimated output file size. After you click Convert, the marked files will be converted to the specified preset without re-encoding; the remainder will be processed using the standard conversion process. SuperSpeed conversion is enabled by default. You can check it in the program settings as shown in the illustration below; you can also disable SuperSpeed here if you don’t want it. 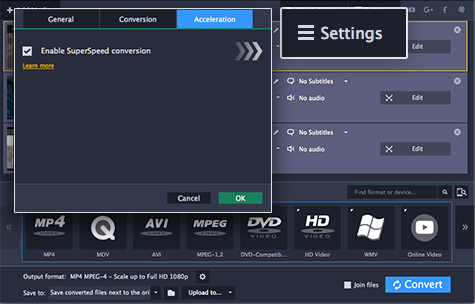 SuperSpeed conversion is supported in the trial version of Movavi Video Converter, but the program will convert only ½ of the video files in this mode. More information about trial restrictions. * Tests carried out by Movavi. Computer specifications: Mac mini (OS X 10.8); Intel® Core™ 2 Duo 2.40 GHz processor; 5 GB RAM – DDR3, 1067 MHz; NVIDIA GeForce 320M video adapter – 125 MB; TOSHIBA MK3255GSXF Media 320 GB hard drive.